Esme , " I am joining our furiends at , The cat on my head today for Sunday Selfies! I am looking a little serious in my selfie aren't I?!" Esme, " Here, this is a silly shot that might make you smile!" 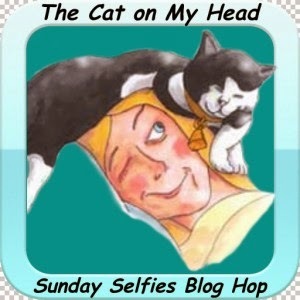 Please drop by The cat on my head to see more furiends with an assortment of fun selfies! Mitalee and her cardboard lounger. Mitalee , " I am relaxing on my colourful, cardboard lounger!" Mitalee, " I did something to make it ALL mine!" Mitalee , " Can you see the tear right by the polka dots?! That's my handiwork!" Mitalee, " I think it gives my lounger a bit of character! " Esme , " Our Vancouver winter has been unusually sunny and mild this year! I am having a bath in the sun almost daily!" Esme, " There is nothing like natural light to bathe in!" Esme, " That's enough "on camera"!" Esme, " The rest of my sunbathing is private. I will stay in the shadows until , " you know who" , leaves! " Wordless Wednesday : Do you remember this face? P.S. For those of you new to our blog, this is our Angel Lewis. He died suddenly one day, within a twenty-four hour period. He was four years old. He was a funny, little clown with a whole lot of sweetness mixed in. We always smile when we remember him. Levon, "I just realized Valentine's day is fast approaching! 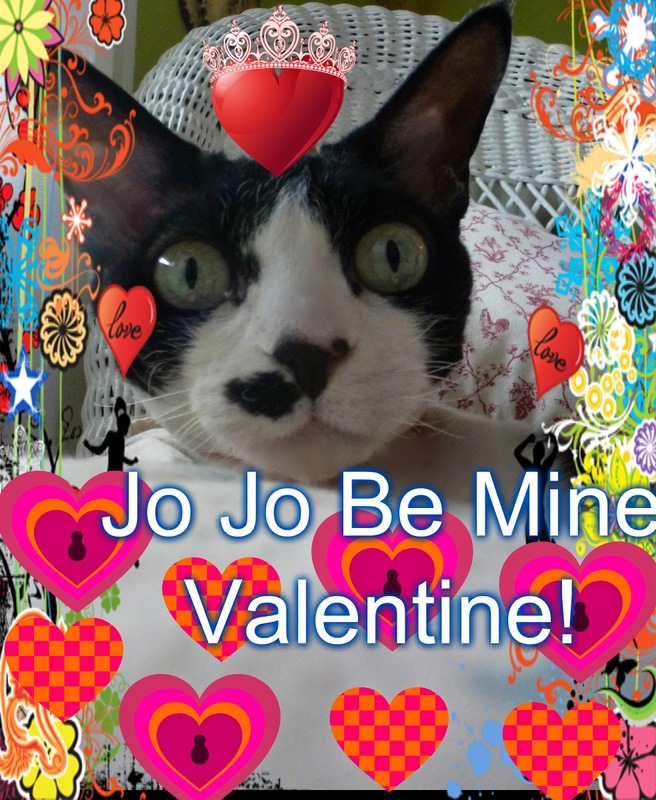 Jo Jo from Nellie in the city asked me to be her Valentine but I didn't ask her to be mine! I know it's a bit early. . . but the early cat catches the bird . . . or something like that . . . so I had better get to it! " Levon, "Jo Jo, I'll be listening for your answer on the airwaves of love." Isadora, " A new groomer cut my furs on Friday. Our friend , angel Pip's person, gave us this idea as she started using this service when Pip was unwell. As some of you may know, I have an enlarged heart now and it is best for me to not get stressed out by anything. Going to the groomer's can be stressful, especially here in Vancouver where you usually stay for the day." Isadora, " My groomer comes to me! She parks a big van in front of the cottage and grooms me inside the van! Look! The image on her van even looks like angel Pip!" Isadora, " She did a most excellent job! She even clipped on little butterflies on the furs of my ears. It only took an hour and then I was back on my cosy bed again!" Isadora, " I'm laughing here. I'm messing with LP! I turn my head every time she wants to get a head on shot of me. Heehee. Hee." Isadora, " Oopsie! I wasn't quick enough and she got me! Having a groomer come to you is not that much more expensive then going to a groomer's. For those of you who find groomer's stressful, this may be a consideration." Sunday Selfies with the boys in the cottage. Levon, " I was attempting to take a selfie and this fantastically intriguing and sweet smelling thing got in my way!" Duffy, " No. . . I was attempting to take a selfie and LEVON got in the way! I wanted to show you my new hat and kerchief and hair cut. LP finally had me groomed professionally and I look much better now!" We are joining our furiends at the Cat on my head for their fun and multifarious selfies. Click HERE if you would like to join the fun and visit other participants! Mitalee, " It's already Friday! Me and Malou pretty much monopolised the blog this week. I like the camera and I often throw myself at it. If I can be found when it is out , that is!" Mitalee, " It's raining here in Vancouver and that forces the birdies into hiding! I remain on high alert by the window though. I am hopeful." Mitalee, " I know I can appear deceptively sweet but if I could talk to the birds, you know, get nice and close to them, actually get outside at all, I would have a nice, fashionable, feathery, bird shawl to keep me warm by now." Mitalee, " But I am an inside cat. I can only admire birds from afar. All I can do is remain hopeful that birdies show up at the feeders at all!" Mitalee , " As you know, I am a lover of boxes but did you know I also love cardboard loungers?" Mitalee , " I do! And my Little Shadow loves them too!" Mitalee, " Malou is my Little Shadow. She can be very difficult to "shake" some days!" Mitalee, " But I am a good sisfur and I indulge her quite a bit!" Malou , " And that is why I love her!" A New Box for Mitalee , Queen of the boxes. Mitalee, " Yoohoo! Over here (me with my leg in the air)! I am cleaning the cobwebs out of my new box!" Mitalee , " It's just the right hight for snoopervising!" Mitalee , " It has all sorts of little peek-a-boo holes!" Mitalee, " I just thought of something!" Mitalee " This may very well be my favourite box yet!" Malou, " I wanted to tell you about the two rescues we like to donate things to throughout the year. One is the rescue angels Tulip and Leo came from ; this rescue is exclusively for cats of all ages. The other rescue we like to donate items to is a rescue for all kinds of senior animals (dogs, cats, donkeys, horses, pigs etc.) that is just outside of Vancouver." Malou, " We recently donated medication, blankets, towels, beds, food, scratchers and toys to that organization. Of course there are no photos because "Menopausal Brain" aka LP, always forgets to take photos to share with you. But this time a volunteer sent us a photo of one of the senior animals with one of the toys we gave them and we thought we would share it with you because it made us all smile real wide when we saw it!" Malou , " Her name is Cypress and she is never without this elephant stuffie that was part of our last "drop off"." Malou, " It's nice to think she has something to hold on to that comforts her , isn't it?"